3' Pre-Lit LED Color Changing White Fiber Optic Artificial Christmas Tree with flashing or steady burning LED micro lights and a star tree topper. Features 125 branch tips, pre-lit fiber optic tree has a multi-color wheel at base, micro LED lights scattered throughout, micro LED light bulb color polar white Polar white bulbs have a slight blue hue to simulate the color of ice, and fiber optic colors on wheel include red, green, amber, purple, blue or white. Comes with a decorative plastic silver stand with fleur-de-lis accents and a 3-way switch for flashing or steady control. 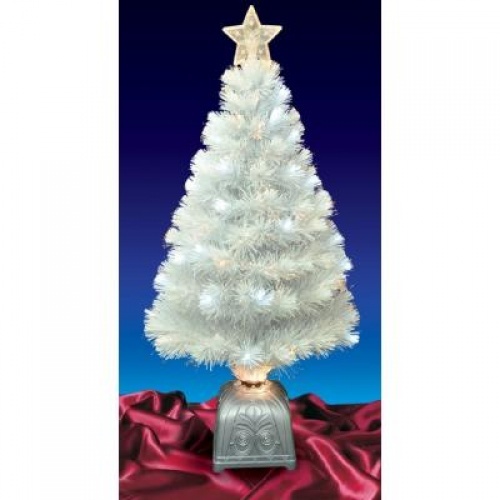 Medium profile tree 2-piece easy assembly including stand UL listed for indoor use only.